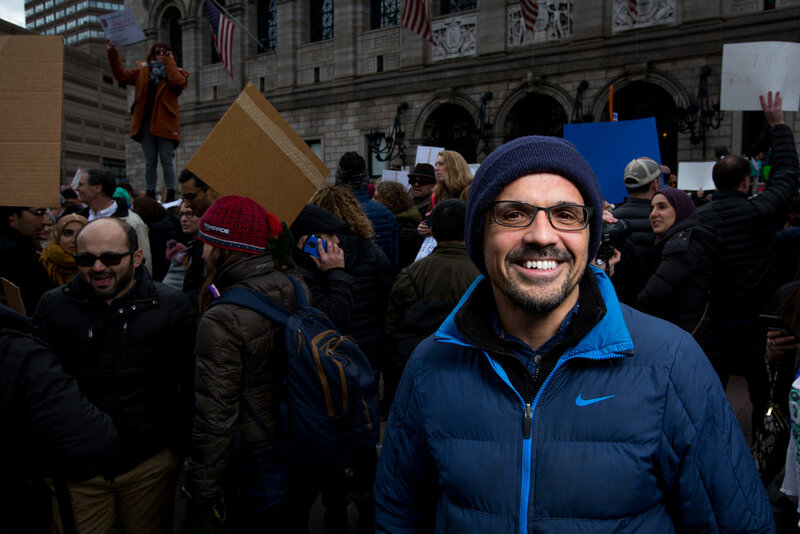 A series of portraits made in the middle of a crowded demonstration opposing the immigration ban in Boston's Copley Square. JAMES - A doctor that works with refugees from around the world. "I’m the son of refugees. I grew up knowing the feeling of being despised and I thought if I could get those people to really get to know me, they wouldn’t feel that way. People used to say things about me, about my family, bad things, and I wouldn’t translate those things for my parents. " Mikenah spoke about being a first generation American, having family from Kenya, and now being in Dental School. All three spoke about many of their friends being immigrants and many of their professors are immigrants or from immigrant families. “That we, American people, stand with refugees and immigrants. And I think for myself, I want my children to know it and to live in a country where all people are welcome. And we’ve been praying for my kids since they were little that they would always welcome other people no matter what their background is. And so, I think for me, a huge part of it is my own kids and then the students and families that I work with who face a lot of fear because of what’s been happening." M: “I don't think this thing is gunna change Donald Trump’s mind, but what we have to do is show what we are standing for: all those immigrants, Latinos, black people, they are not alone, we are standing for them - standing together." Jocelyn and Jason spoke about their kids having Muslim friends at school and being afraid that because of Trump, their friends and teachers will be sent away. Beth spoke about being a high school teacher and remembered learning about history/WWII and thinking "What would I have done?" So she showed up. 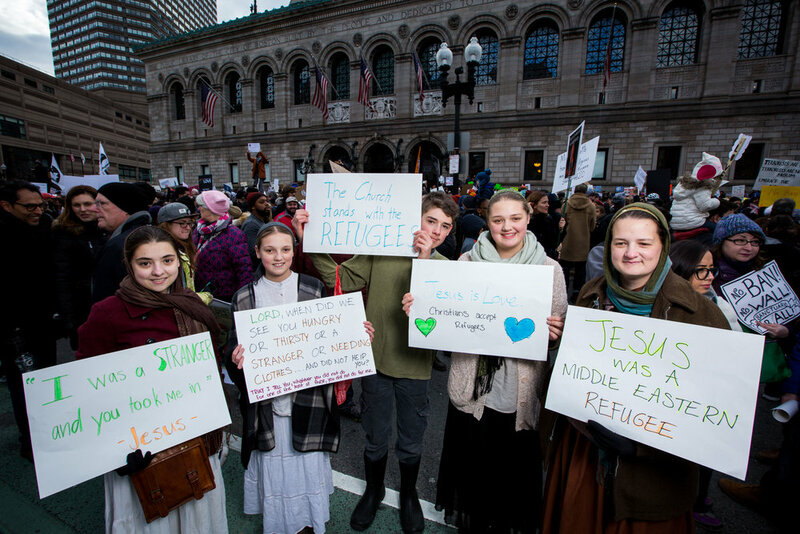 "We want to show the side of Christianity, of the Bible, that says, ‘feed those that are hungry, help those in need, accept refugees - for love, for peace.’"
"As a Muslim we’re happy to be here. We’re not terrorists. There’s a misunderstanding between terrorists and muslims." 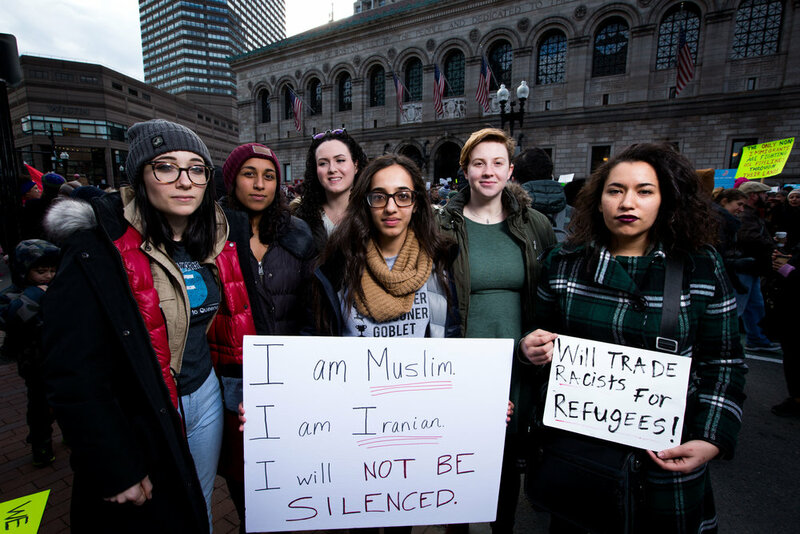 "We want to open people’s eyes as to who we are - people who voted for Trump or people who just want Muslims out. I’m here for hope too; so my uncle can come here from Iran."